Meenmutti waterfall, the most spectacular and largest of all Wayanad waterfalls, is also the second largest in Kerala, just after Athirapally falls. Spectacular display of voluminous plunge of water is accompanied by impressive thunderous roar. At times, it can faintly be heard as a murmur even at the remote slopes of Vythiri. Important info : Meenmutti waterfall is currently closed for visitors. If you have plans to visit, check in advance with Wayanad District Tourism Office. Meenmutti (also Meenmutty) falls drops down massively in three tiers from a height of 300 metres. Following an arduous trek of about a Kilometer, visitors feel pleasingly relieved reaching the bottom waterfall. Upon capturing enough of the waterfall in their minds as well as cameras, the next inclination is to join the pool, which appears quite inviting. Those lucky to visit during non-monsoon period get access to the pool. There they find a new meaning to re-invigoration. Unspoilt terrains and wild forests tell a story of minimal human interference. A feel of oneness with nature gradually conquers hearts. Similar to nearby Soochippara waterfall, Tourism Department maintains a check point at Meenmutti. Waterfall area is a plastic and alcohol free zone. Strict adherence to policies has helped considerably to maintain the magnificence that is Meenmutti. Other waterfalls in proximity are Soochippara and Kanthanpara. Meenmutti together with those falls form Chaliyar River, further along the line. Most visitors find the trek to the lowest falls itself very tiring and daring. Venturing beyond is not for everyone. Adventure welcomes you with both hands and at once puts a hundred butterflies in your stomach with a cheeky smile. The limited few, who trek to the upper falls, find their trekking skills put to a test. Climbing through dangerously sloppy terrains require strength and courage. Forests spread over neighbouring areas teem with wild animals. They can get to the trek path too! However, the redeeming fact is that Guide services are available to help with the trek. They know the terrains and can sense animals quickly. Simply put, they know what they are doing. 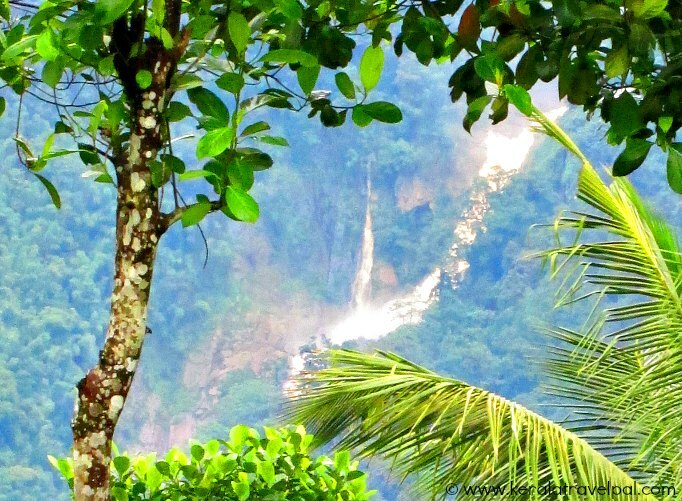 As the trekkers reach each upper level waterfall, they witness the magic of Meenmutti again! Trek is hard, but the taste of magnificence makes it worthwhile- so goes the general sentiment. Also there is a fabled trek from Meenmutty to Nilambur. Usual road travel time is 4 hours. Trek through the middle of the forest is done in 6 hours. This mother of all treks is ventured by only a limited few, thirsty for raw adventure. It is possible to camp near the vicinity of the waterfalls. Sleeping in a territory of tigers, leopards, elephants and other wild animals carries enormous risks with it. Requiring sufficient precautions, it can only be done with prior permission from forest officials. The waterfall has been closed for visitors for a while following a series of deaths. Reaching the waterfall is risky and authorities decided to close the waterfall for visitors. There are spots such as Sunrise Valley where you could see the multiple cascades. However, that is only a distant view. If authorities allow permission to access, then the best time to visit the waterfall is October till May. Wet conditions of June till September convert treks to aggressive combats. Those managed to beat challenges, find themselves standing at the feet of a fatter and angrier Meenmutty. Meemutty is a perennial waterfall, with good volume of water even during summer. That eliminates the major element of disappointment during any waterfall visit. Lodges and hotels are available at the nearest towns of Meppadi and Kalpetta. There are also several resorts scattered throughout Wayanad District. Home stays are available in areas not too far from the waterfall. Blue yonder, an organisation for social betterment, also arrange home stays in the nearby plantations. Meenmutty heights resort located near the waterfall offers several programs including Ayurveda and Yoga. Meenmutti is located 22 kilometres from Kalpetta and 12kms from Meppadi. The waterfall is at about 4 kilometres from Vaduvanchal on Ooty road. From approach road, 2 kilometres travel takes you to the waterfall. Out of that, 1 km can be traveled by vehicles. This drive through tea and teak plantations forms an appropriate prelude. The rest of the travel, carried out on foot, is quite daunting. Clinging on to ropes on the walkway is helpful in case the slopes are slippery. Nearest towns : Meppadi at 12 kms, Vaduvanchal at 6 Kms and Kalpetta at 29 kms. Railway Station : No rail access to Wayand District. Nearest Railway Station is Kozhikode at 100 Kms . Food Options : A few restaurants at Meppadi, more at Kalpetta. Accommodation Options : A few homestays and Meenmutty Heights resort near the waterfall. A few lodges and hotels at Meppadi town. More choice at Kalpetta, the largest town in Wayanad. Best time to visit : October to May. Beware of slippery condition during wet season. Visiting hours : Waterfall entry is restricted to 7:30 AM to 5:30 PM. Nearby Attractions : Chembra peak, Edakkal Caves, Soochippara waterfall, Kanthanpara waterfall, Kalpetta town (shopping & food), Muthanga Sanctuary, Pakshipathalam, Kuruva Islands, Banasura Sagar Dam, Tholpetty Sanctuary, Pookode Lake and Thirunelli.